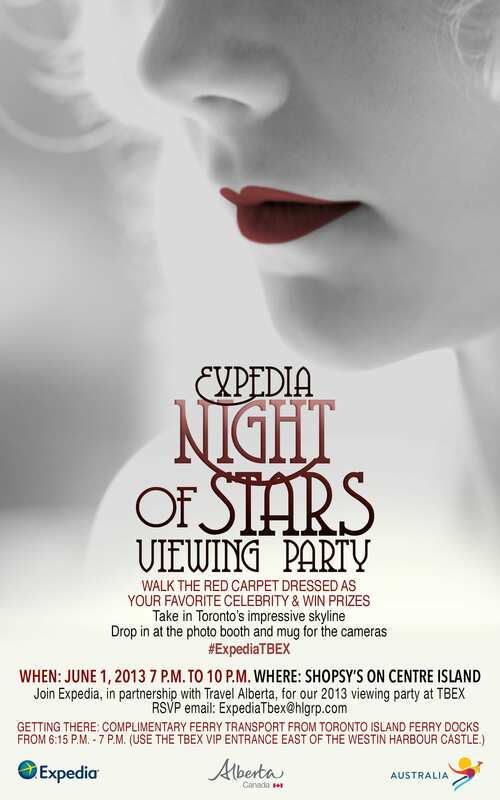 Join Expedia, along with our gold sponsor Travel Alberta and silver sponsor Tourism Australia, for our 2013 Night of Stars Viewing Party to celebrate TBEX 2013 as well as the launch of the Expedia Viewfinder Blog. A night of food, drinks, dancing, networking and pure enjoyment awaits all registered TBEX attendees. Pop into the photo booth, have your picture taken on the red carpet and dance the night away! Enjoy the gorgeous cityscape of downtown Toronto while getting into the viewing party spotlight. We’ll provide accessories and swag to make you feel like a celebrity. Want to really get into the mood of the party? Walk the red carpet dressed as your favorite celebrity! Festive attire will be rewarded! All attendees are eligible for trip giveaways! This party is opened to registered attendees only, and a badge will be required for entry. Not registered yet? You still have time to register and enjoy the best TBEX ever. Please RSVP to ExpediaTBEX@hlgrp.com and bring your TBEX badge for ferry and party access. We’ll see you there! Sounds like a blast. Can’t wait. Anticipating a fun event. Cheers. Just RSVP’d – can’t wait! I already left home and don’t have any celeb attire…darn! Awesome location — Centre Island has such great views of the city!